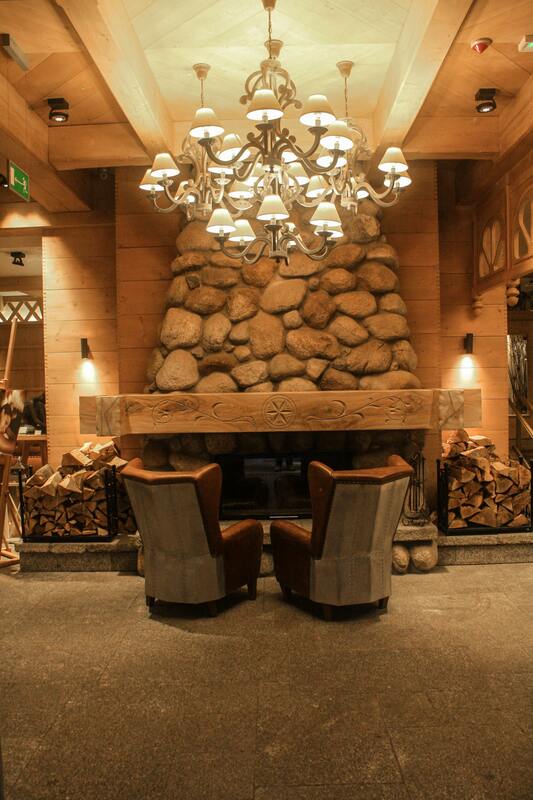 The lobby invites you to relax at the wonderful stone fireplace. As soon as I stepped off the train from Krakow, an aggressive drizzle began to fall from the overcast sky. By the time I reached the taxi stand, conditions deteriorated to a hard rain. Ten minutes later, after my driver dodged hundreds of tourists scrambling under insufficient umbrellas to seek shelter, a deluge was drenching Zakopane, severe enough to prompt warnings to get out of the surrounding mountains and forests, beware of flash flooding, and possibly start gathering pairs of animals and building an ark, auguring an extended stretch of adverse conditions. This was not what I was hoping for upon my arrival in the southern Polish town of Zakopane. My entire stay here revolved around hiking in the Tatra Mountains and enjoying arguably the most scenic area of Poland, but it looked like the relentless torrents were going to destroy my plan. None of that mattered, however, when I slogged into the lobby of ARIES Hotel & Spa, soaking wet. A large stone fireplace, with two inviting leather chairs, was the first to greet me, followed by the friendly and quite helpful receptionist. Surrounded by light pine wood, the long lobby defied the hostile weather outside, and I immediately started to warm up to Zakopane. Past the high-end jewelry shop and the concierge’s desk that resembled a very large suitcase, I tugged my luggage along while listening to standardized versions of pop songs like “Bette Davis Eyes” and Adele’s “Hello” piped into the hallways. Down the hall with pine cone designs in the carpet, I entered my room and suddenly didn’t care if it ever stopped raining. I knew I would be very comfortable here. 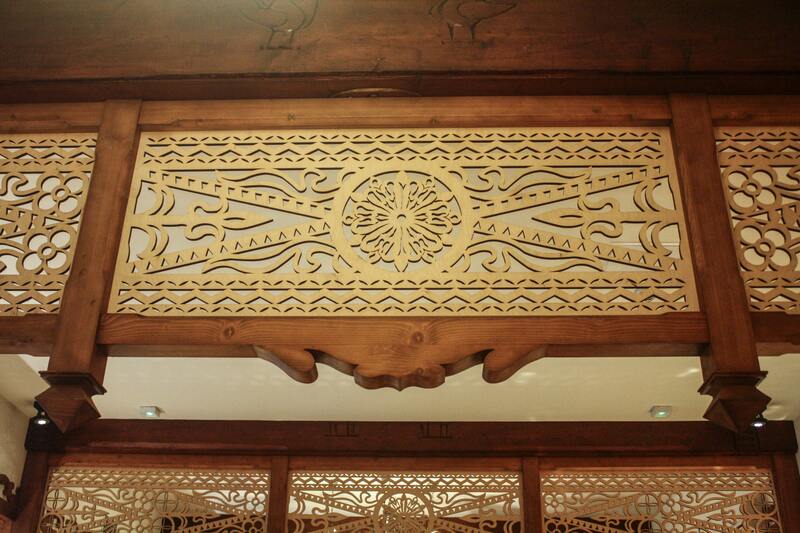 Gorgeous wood carvings add extra character to the hotel. What wasn’t to love? The fine bed that ensured a restful night’s sleep? The leather club chairs to sink into to watch a little hi-def television or access the free wifi? The spacious bathroom with aromatic toiletries? The lovely accents, like the pine cone closet door handles and the Aries ram coat hooks? Everything gelled into a soothing atmosphere that belied the town’s overcrowded main drag just one minute away — close enough to partake in all of Zakopane’s charms, yet isolated enough to easily escape the throngs. Outside, the wood and stone hotel, built in the 1950s, bears a steep pitched roof with rows of dormer windows, a perfect mountain hotel that bore a passing semblance to the Overlook Hotel in the original The Shining movie. At one end, a comfortable lounge invites you to relax over a mixed drink, some snacks, or a fruity smoothie. At the other end, you’ll find a massive breakfast awaiting you every morning in the Halka Restaurant, overflowing with everything from eggs and tasty breads to pastries, a wide variety of meats and cheeses, and some sort of oddball fish yogurt. Come back here for a pre-dinner drink by the fireplace and then enjoy a meal under the intricately carved wood panels with parzenica designs (heart-shaped patterns that are a traditional hallmark of Polish highlanders) or by the wall lined with round cross-sections of juniper trees and a shelf loaded with romantic lanterns. Take it all in while enjoying sheep milk cheese with powder and cranberry sauce, and some tender wild boar with campfire potatoes and roasted carrots. And, of course, the indulgent spa will also help you knock off a couple of hours when you’re forced to stay indoors. 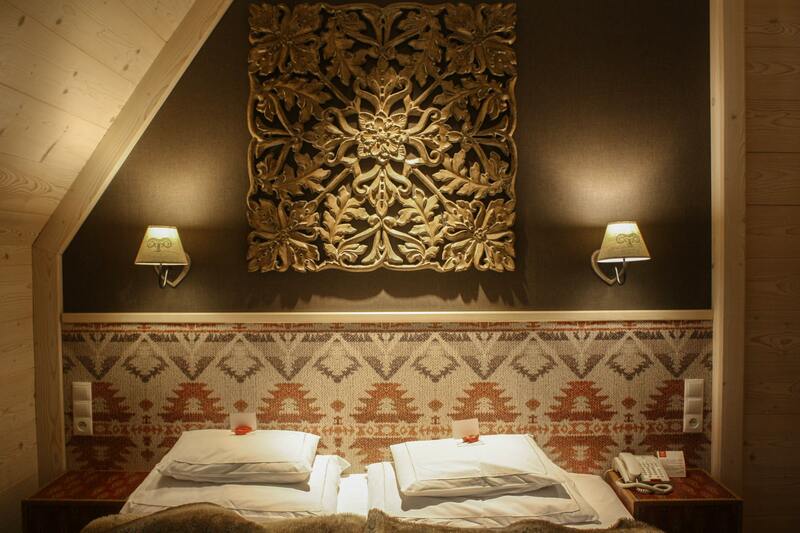 Your wonderful room is highlighted by beautiful carvings and a subtle ram motif. So, whether you need to escape inclement weather or suffocating numbers of tourists, or you just want a very fine place to rest your weary body after a day of outdoor adventures, you can’t get any better than the ARIES. And, while you’re here, keep yourself entertained by hunting for instances of that zodiac symbol — they don’t show up only in your room.